So this is life-changing. I mean, next to no-churn ice cream, vegan ice cream is pretty darn cool. Who knew you could make thick, creamy vegan ice cream at home? I didn’t. That is, up until this week when I tried my hand at it. Wow was I pleasantly surprised. 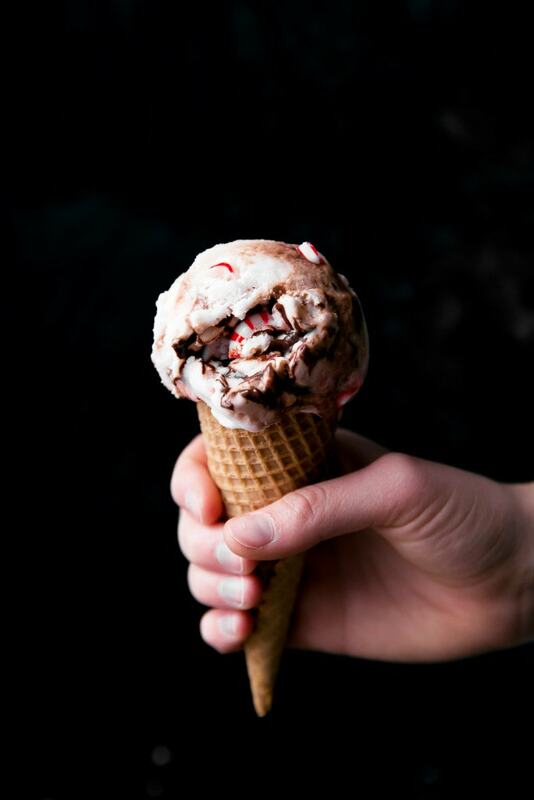 Though lacking the dairy component, this peppermint ice cream is still velvety smooth thank to the full-fat coconut milk. And for those of you that are thinking but I don’t like coconut, well, you’re in luck because you can’t taste it at all. The end result is pure pepperminty goodness. Of course I had to include a little chocolate in the ‘scream. Plus, I really like the name fudge ripple. It makes me drool. I love the fact that though this ice cream is vegan, it doesn’t mean it’s for vegans only. Some vegan desserts taste a little off to me, because they’re not meant to be vegan. But this ice cream really shines sans dairy. I know it’s winter and all, but I’m actually a huge fan of seasonal ice creams. Though the ice cream is cold, the winter flavors are warm and delicious, and make for an awesome cold-weather treat. 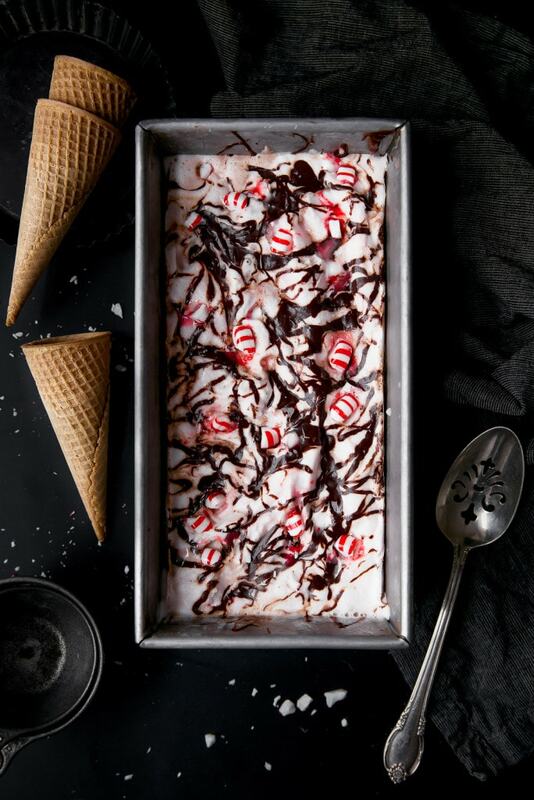 To make this peppermint fudge ice cream, you’ll first need to heat the non-dairy milks in a saucepan with the sugar until the sugar is fully dissolved. Once the sugar is dissolved, remove the mixture from the heat and stir in the peppermint and vanilla extracts and a pinch of salt. Carefully pour the vegan ice cream base into a ziplock bag and place it in the freezer for half an hour to chill. Once chilled, churn the ice cream in your ice cream maker (the exact amount of time it’ll take varies depending on the type of machine you own!). After the ice cream has been churned, pop it back into the freezer. Make the fudge ripple sauce, and do your best not to eat all of it while you wait for the ice cream to freeze. Once the vegan ice cream has frozen, stir in the crushed peppermint candies. Then scoop out half the ice cream into a loaf pan, and pour the fudge sauce over top. Plop the rest of the ice cream on top and then cover the pan with plastic wrap. Freeze overnight until firm. 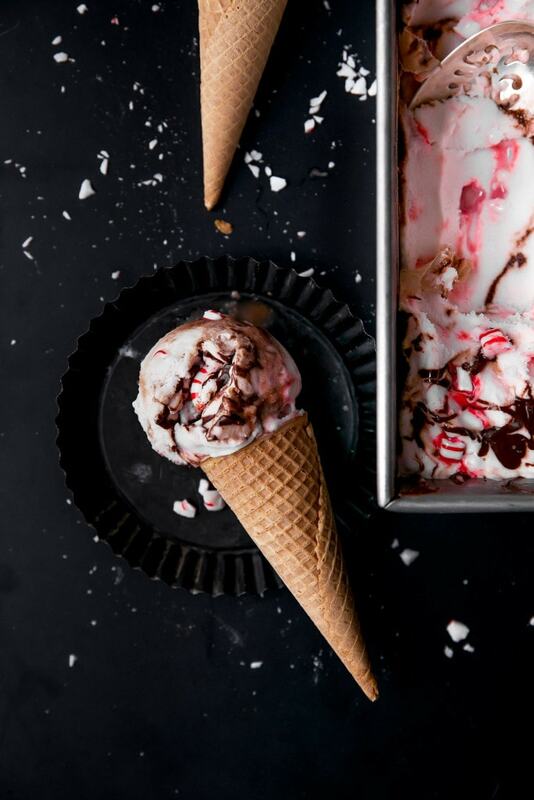 This vegan peppermint ice cream would be a great addition to your holiday table, whether that means served on its own or dolloped on top of a warm, ooey gooey brownie. In a medium saucepan over low heat, combine coconut milk, Almond Breeze, and sugar. Mix until sugar is completely melted. Remove from heat and stir in extracts and salt. Place in a freezer-safe gallon ziplock bag and place on its side in the freezer. Allow to chill for at least 30 minutes. Remove from freezer and churn in an ice cream maker according to manufacturer’s instructions. 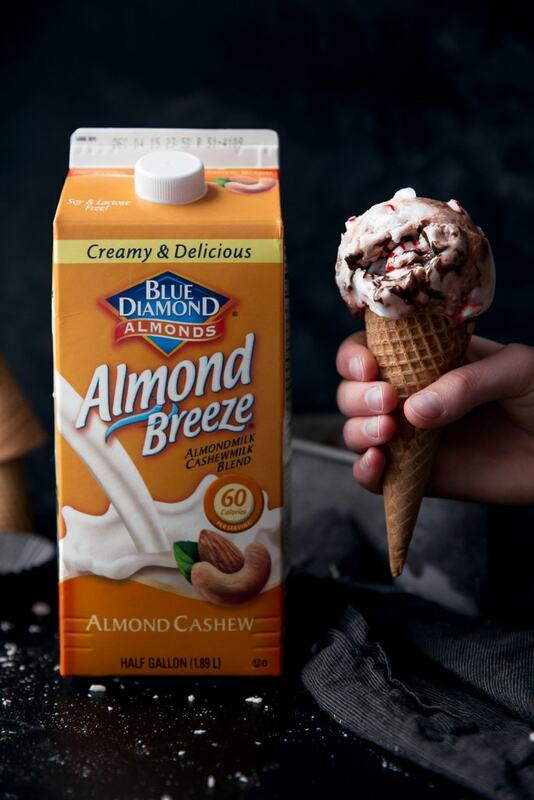 While your ice cream is freezing, combine chocolate and Almond Breeze and microwave in 20 second increments until smooth and completely melted. Once ice cream has frozen, stir in crushed peppermints. Scoop half of ice cream into a large loaf pan, then drizzle with half the melted chocolate. Use a toothpick or knife to slightly swirl in the chocolate, then top with second half of ice cream and repeat with remaining chocolate. Cover tightly with plastic wrap and chill for at least 12 hours before serving. Giiirrrrrl YES! I have backed away from making ice cream for the season (why? I have no idea!) but I think this might have to be made before Christmas comes and goes! Yes, this is SO you, Abby!! Lovely ice cream (and photos! ), Sarah and love the peppermint/chocolate combination. I want and need this ice cream now girlfriend! YAS! This looks so much like real ice cream! Absolutely decadent. I have a friend who can’t have dairy and I always wonder what to do for her when the rest of us are inhaling ice cream… I can’t wait to give this recipe a try! Such a stunning holiday ice cream! I really love the coconut milk in there too. Such an awesome addition! Y to the ES!!! This is one freakishly gorgeous ice cream and I can’t believe it’s vegan! You are speaking to my heart, gurrl. You are my hero! This is totally life changing and I cannot wait to make this! LOVE. Yes, you must Lauren! Thank you thank you <3! I’d like to think I refrain from making myself even colder by eating ice cream in the winter but who are we kidding?! obsessed with this holiday flavor!! Oh god ice cream is a year round thing in my book. Duh! That’s fantastic, Angela! Hope that you enjoy it, then!! I freaking love this ice cream and LOVE that it’s vegan!!! Definitely going to look for that Almond Breeze Almondmilk Cashewmilk Blend!! Thank you Alice! I’m thinking about experimenting a lot more with vegan and gluten free in 2016, so I’m glad you enjoy it! Hehe… that’s all I’ll make anymore… vegan ice cream is just as delicious as dairy and it’s easier to make! Love it! Delicious recipe my dear! This looks easy to give a try 🙂 I bet people can’t stand the attraction of ice cream. Thanks for sharing the recipe! Looks fantastic~! Can you recommend a substitution for the cashew milk though? I live overseas (Asia) and it’s just not available here. Do you think soy or almond milk would work? Or actual cashews? Any suggestions welcome and thanks! Yes, almond milk would work! Thanks for asking Dawn, and enjoy!